Polished finish, flat center. Sterling silver inlay. Width: 6mm. Comfort fit, made of commercially pure [CP] titanium in China. Bought this as a replacement for a lost wedding band. Had my finger sized at a local retail shop and then found this design online. It was closest to my original band. I was a bit hesitant at not knowing for sure if the band would fit well, but the return policy was favorable so I took a shot. 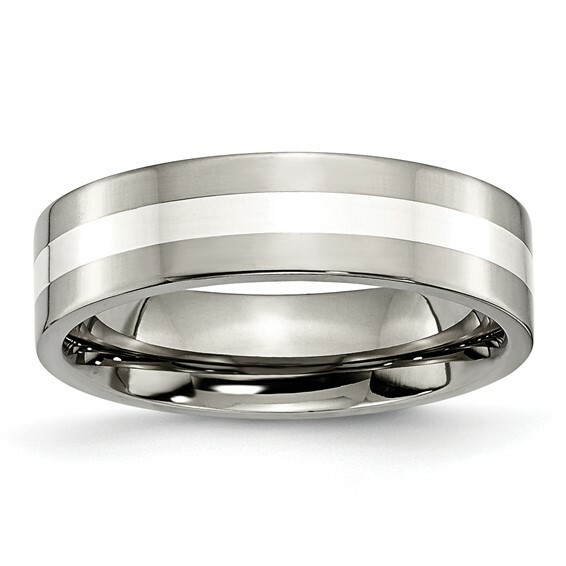 Turns out the band is a perfect fit and is exactly as described on this site. Very pleased with the purchase.